After Solidarity signed a measely pay increase for Post Office workers and defended the use of unpaid overtime, the union has come in for harsh criticism for its collaboration. 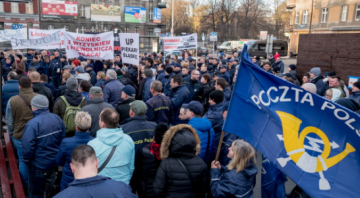 Over the past couple of years, postal workers from around Poland have been expressing their demands for better working conditions and have been doing so outside of the main unions at the Post Office. Workers see that these unions work more to defend the interests of the employer than the workers. Last year, a series of actions, including work stoppages were held, organized by the workers themselves, outside of the unions. At first, these were mostly actions of mail carriers, but later, other categories of workers also joined in. Some members of ZSP working at the Post Office engaged in contacting the different groups of workers and together organized a national coordination to put forward demands agreed by workers themselves – not by union bureaucrats with zero accountability to the workforce. In the first of three national meetings, workers set out a list of demands, including a raise, with basic pay to rise to 3200 zloties, payment for overtime work and reorganization of the regions. (Currently, some workers have to cover much more ground than other and the assignment of good or bad regions are often the result of favouritism or used as some form of keeping people in line.) In March, workers organized a series of protests on the same day in 23 cities throughout Poland and then at the beginning of April, a demonstration in Warsaw in which more than 2000 workers participated, making it the largest workers action outside the mainstream unions since the transformation. In the period leading up to and during the protests, both the management of the Post Office and the leaders of the Post Office went on the offensive. One of their first lines of attack were various attempts to discredit the ZSP in order to destroy the national coordination. Particularly active was the Solidarity bureaucracy in Opole, run by an individual with far-right ideas whose claims verged on paranoid conspiracy theories. Defenders of the current government and the church also weighed in. Solidarity is of course closely linked to both. Their role in the current social and political situation is first and foremost to maintain the pact whereby they have more influence with the state but they also must protect the state against any protests by workers. As such, in recent times they have constantly gone against other workers who are protesting in the public sectors, be it in public schools or the Post Office. After the March protests, Klaudiusz Wieczorek from Silesia was fired for his role in the organization of a protest in Katowice and after the April protest, so was Rafal Czerski from Wolomin, near Warsaw. Both are seeking reinstatement. The case concerning Klaudiusz was to start on May 30 but has been postponed by the court. Postal workers from all over Poland have shown solidarity to their repressed colleagues. In the meanwhile, postal workers have been waiting for a response to their requests to discuss their situation, which has been ignored by the management of the Post Office, as well as the government. At some point, probably in a move to lull workers, it was suggested that a special meeting by organized in the Senate to which workers would be invited. In the meanwhile, the Post Office concluded an agreement with Solidarity and another union at the Post Office, concerning the working conditions of everybody, the majority of whom did not agree that Solidarity negotiate on their behalf. The agreement guarantees a wage increase of 150 zloties – keeping the basic salary far below the norm and just above the minimum wage. In fact, taking into consideration that the Labour Ministry would like to increase the minimum wage by 100 zloties next year, this pay rise is only 50 zloties more than what the Ministry considers a necessary raise for the lowest paid workers. As a union fighting against all forms of employer abuse at the workplace, such words are completely unacceptable to us in any situation, but they are made even more scandalous coming from somebody who pretends to be fighting in the interests of workers. For years, workers throughout Poland have had to suffer with unions who do more to protect their cushy full-time positions, paid for by the companies, and the political cronies with whom they share the benefits of the system which puts the workers under the management of collaborationist unions. It is time for a new type of unionism, born from below, controlled by the workers themselves, without all the professionalized and collaborationist schemes that make people like Nowicki, with his shameless defense of exploitation at the Post Office, an unfortunate example of the pathology of those who have come to be in charge of the fate of workers at many companies. ZSP stands firmly behind the demands generated by the workers themselves and their struggle to free themselves from the poverty imposed on them by the government which has underfunded some public sector jobs but continues to support both large layers of cronies in exchange for political support. We also criticize the questionable use of funds already in possession of the Post Office in ways that do not benefit the workers in any manner. We are hoping that in the fall we will see a strong response to the situation.